Start today: Help your child stay at a healthy weight for life. Yes, it’s true! The first years set the stage for healthy habits for the rest of your child’s life. It’s never too early to start. We know how important the first years are for getting your child off to a healthy start. We also understand that being a parent is an important — and hard — job! 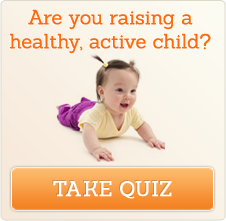 So we talked to hundreds of parents to find out what works when it comes to raising a healthy active child. Good eating habits begin early. Even small children need to get moving. Being a parent is an important job! "We make it fun…we make smiley faces with the vegetables and they help me prepare things. That’s a huge thing, when they take part in making it, I think it’s like oh, I want to eat this. " Healthy Active Living for Families (HALF) is a program of the American Academy of Pediatrics (AAP). The goal of the project is to partner with parents to encourage healthy habits right from the start. Funding for the HALF program was provided by Nestle Nutrition Institute. The Healthy Active Living for Families: Right From the Start program (HALF) strives to integrate the parent perspective and voice into evidence informed pediatric health guidance for early obesity prevention. The American Academy of Pediatrics has spoken with over 200 parents of children (newly born up to age 5) across the nation both English and Spanish speaking, to explore attitudes, needs and experiences related to messaging for healthy nutrition and active living. Development of the HALF program was led by an editorial board comprised of experts in obesity prevention, clinical care, psychology, and community health and a parent team serving as a real life "touch point" to advise and inform all phases of the project. What makes the HALF program unique is that it takes into account the parent voice and experiences while understanding that pediatricians, as experts, bring a specific skill set to the interactions around obesity prevention. Both perspectives are critical and the HALF program navigates this parent and pediatric health care provider dyad. Building on the Bright Futures Guidelines, the national standard for pediatric well child care, guidance from HALF captures the understanding that the first priority is to attend to the concerns of the parents during each well visit. The HALF materials provide an excellent opportunity for clinicians and parents to promote healthy weight, nutrition, and physical activity, three key themes in the Bright Futures Guidelines.